As with many aspects of life, prevention is the best course of action. Exercise prevents heart and health problems, seat belts prevent loss of life, even door locks prevent intruders. Your oral health is no different. Prevention is the key to a healthy mouth. At our Gresham dentist office, we use dental sealants as a preventative measure to reduce tooth decay and cavities. This is just one of many ways we are working to improve our patients’ oral health. Dental sealants are often comprised of a composite resin that begins in liquid form. The liquid is painted on a clean, dry tooth and then hardened by the use of a special light used by our Gresham dentist and staff. The thin, liquid nature of sealants allows the material to coat the pits and grooves located on the surface of teeth, especially molars. This coat of protection keeps food particles, bacteria, and plaque from invading these hard to clean areas. Nearly anyone can benefit from dental sealants. However, the most common recipients of sealants are children and adolescents as the molars come in. Adults whose teeth are clear of decay may also benefit from a dental sealant procedure. The process is pain-free and keeps teeth protected for years, reducing the risk of cavities forming. 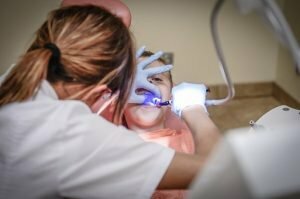 Why the need for dental sealants? Plaque forms on teeth in as little as 4 or 5 hours after brushing. In hard to reach crevices, plaque continues to build up. Plaque leads to decay which then begins eating away the enamel of the tooth, forming a cavity. This is one of the main reasons dental sealants are so beneficial. The sealant gets into these small places providing a barrier against plaque and decay. After your dental sealants have been applied, care for them is simple. Brush twice each day and floss daily. Sealants give your teeth extra protection and work to prevent cavities, but only with the help of proper hygiene. Additionally, regular checkups with our Gresham dentist will keep your oral health in great shape. If you are interested in preventing cavities and protecting your oral health, give our Gresham dentist office a call. Sealants take just a few minutes to apply, but save you the hassle of dealing with cavities. More oral health topics can be found on our Facebook page or by talking with us at your next appointment. We’re always happy to discuss your oral health needs.